This was a vegan wedding cake & cupcake combo that I did for a couple who got a phone call 2 and a half weeks before their wedding that the person who was set to do their cake was not able to. So, they gave me a call and asked if I could do it for them. It was cutting it close, as I would be out of town for that next two weeks, but GOD was good and help me to come through. This was a Vegan carrot cake with butter cream icing. There was a major lesson I learned from this order. Before you decor your cake, make sure you ask the biggest question of all….”Is there Air condition in the facility were the reception will be and is there a fridge that will have room to store the cake until it is ready to be set up?” The temperatures that day were HOT (80’s) in the basement of the church and the cake was taking a beating and in fear of melting down from the butter cream icing. Vegan butter cream has a higher melting point, than regular butter cream or icing. So, you have to be very careful with the environments you will be in serving. Things did work out in the end, it didn’t melt down, but it was close, lol. and it turned out great! It was a beautiful wedding and great lesson learned. 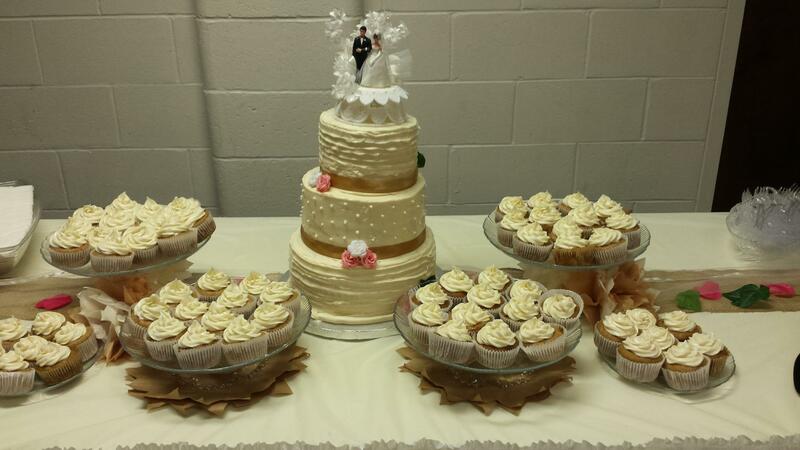 3 Tiered Carrot Wedding cake with butter cream icing and 200 cupcakes with butter cream icing.